Greetings from a Swedish supporter of West Ham United and IFK Norrköping. What a beautiful and historical collection of badges. When I see the badges I get a bit emotional. These badges have been through blood, sweat and tears. They have seen both adversities and successes. Keep up the good collection and work. I really appreciate it. Cheers mate! Greetings from a Greek supporter of Olympiakos and West Ham. Great site with historic badges from all over the world. 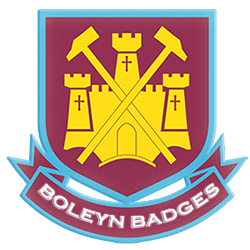 Enjoy seeing all the hammers supporters badges, the foreign club badges and all the great pictures you've posted on KUMB from West Ham's rich history. Great website with great badges. Love this site. The badges hark back to a more pure time of football and really appeal to the emotions. Great twitter feed with West Ham pics to. Top site, top man! Hello mucker. So pleased you've put this together. It's beautiful. Sending you a present. With much love and happy memories. Greeting from Barking and congratulations on a superb site. Keep the good (but no doubt hard) work. Very interesting and informative site. Didn’t realise how many badges some clubs have had. Glad you acquired some Burnley badges Steve. Keep going mate. I’ll see if I can blag some on my travels for you. Great site by a proper football fan with a genuine passion for the game and memorabilia. All the best from Birmingham City and as we say KEEP RIGHT ON!! Cheers, Steve. Great Site Steve. You will have to add a upside down Australia with Hammers written across it. As a Partizan Belgrade supporter I am so pleased that Partizan as well as Serbian Hammers badges find its places on this magnificient site. Keep the brilliant work! Great site, labour of love no doubt. A great piece of history. Quality products from an absolutely quality bloke. Proper West Ham.